Martin Luther King Jr. Day is a notable checkpoint of growth for me. It serves as a beacon for so many things I’ve devoted myself to learning around bias, racism, privilege, fear and what it truly takes for us to build a world where each person experiences dignity and agency. I used to think of MLK as a historical figure. Of course that’s true. And yet the challenge of thinking of him in the context of history alone (along with the Civil Rights Movement, slavery and countless other things) is that I didn’t fully grasp how much work remains to be done to realize his beautiful dream for the world. 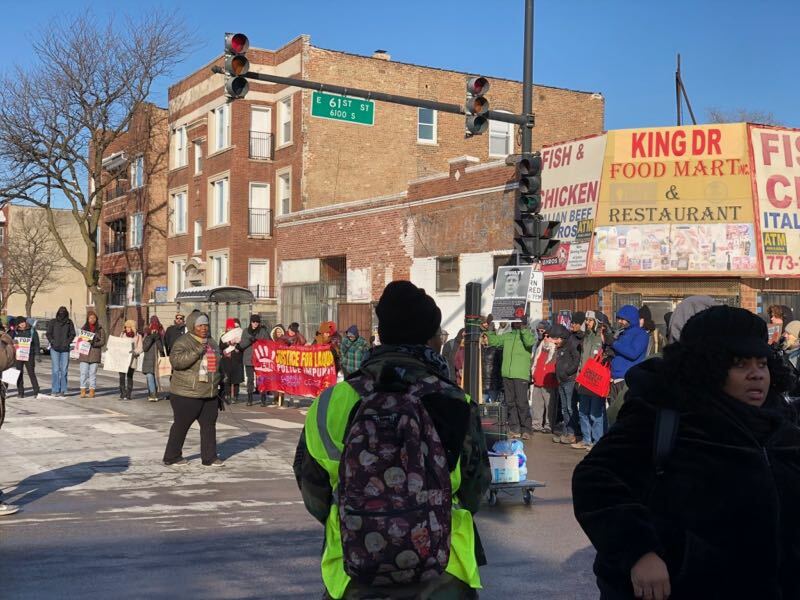 Our leaders for the Black Lives Matter Chicago Justice for Laquan McDonald march down King Drive on MLK Day 2019. Even that language is reinforcing how MLK was whitewashed to be attractive and acceptable to people like me: white people who don’t face the full horror of how we all got to be here and what remains today, at least not on an ongoing basis. It’s easy for me to think of MLK as an eloquent, quietly powerful preacher who suffered the ultimate consequence for his beliefs. There’s more to it than that. Yes he was eloquent. I’ve been quoting him most of my life. I read “Letter From a Birmingham Jail” as a privileged college student who couldn’t be bothered to attend class all that much. I “appreciated” his suffering from the standpoint of history and eloquence rather than the abject and systemic devastation of entire civilizations of sovereign human beings by people who look like me. Martin Luther King Jr. was a revolutionary. He was angry. Why wouldn’t he be? He saw things from a perspective I’ll never fully understand. This realization alone motivates me to devote my life to learning and never assuming that my fear and pain is equal to anyone else’s. He found a voice when many forces worked against him. That voice became well known after Rosa Parks made her stand on the bus. All of that helps me muster the courage to find mine now and be something more than the white moderate who plays it safe. In my exploration of whiteness and my cis white male privilege, I’ve noticed a correlation between this journey and the commonly held stages of grief—what I’m feeling as I pass through each new layer of knowledge while trying to hold on to a safe former way of being with my more comfortable worldview. Any system of oppression relies on the sustained ignorance of its beneficiaries in order to perpetuate itself. This is naturally how any human animal operates. We process information we collect first through the filter of fear in order to make sure we are physically safe. Generally this leads to a fear of change, which can represent a threat to that feeling of safety. When it comes to dismantling the deep layers of history I learned that were incomplete or simply untrue, this journey has been neither easy nor linear since my ego clings to my worldview second only to my physical safety. And yet this exploration of conditioned identity (which I define for myself as entitled imperialist) is necessary for healing, growing and being a stand for the way forward rather than collapsing under the weight of all this new knowledge, which has happened on many occasions. As hard as it is to wake up to the reality of what it took to build a society that creates and sustains my privilege, I assume this must still not hold a candle to the agony of waking up to realize the entire system is stacked against you. I grew up with and bought into the colorblind rhetoric that followed MLK’s death—that I should not see race because everybody was equal. I could avoid taking responsibility for playing my part in the system by saying I was conditioned this way. Yet I choose to view this as a form of denial. This may be the hardest step to take, because it’s the first step out of the comfort of conformed identity. My ego fought HARD to avoid owning my part in all this. And the truth was always patiently sitting there just waiting for me to pick it up. Ego loves to have someone else to blame. If someone else is wrong or less than me, it inflates my own identity consciousness. My anger came in different waves. First I was angry about being white, being attached to all this horrid behavior. Then I was angry about my inaction. And at times I was angry with the messengers who were taking a risk by sharing these truths with me. This turned out to be a way to deflect the guilt I was feeling, and the fear that was settling in about my loss of identity. A conflict of identity triggers the deep biological fear of being kicked out of the tribe for not belonging, which could mean death. For me this is tightly woven together with anger. I’d look at my privilege and wish I could somehow scrape it off my skin. My intellectual mind would perform endless calculations of how I could avoid responsibility for being part of this system. I’d test out all kinds of theories with anybody who would listen. Part of privilege is the ability to walk away from discussions, situations and even awareness that it exists. I’ve spent a fair amount of time hiding from it. It’s easy to feel hopeless when confronting a system so large and insidious as American racism. There is no guidebook. There is no consensus. I started writing one and failed to bring courage to publish it. I denied myself things that I believed were born out of privilege including money, power, romance and even my own happiness. Finally I’ve let the benefit of time (another privilege) settle these challenging emotions into something more tangible and aspirationally useful for the world. I’ve written dozens of pages of notes. I’m finding my voice speaking about racism and enrolling other men in the discussion. I’ve desensitized myself to words like “privilege” and “fragility” so that I can converse about these important matters without being constantly triggered. I’m aligning myself with the people who have been doing this work for a long time. I accept that I can hold space for the true history of our great nation AND help people reconcile our place in this continuum so that we may continue to accelerate progress to avoid delaying (and therefore denying) justice to so many. I’m come to realize that a rigid worldview is an incredible indulgence. It is up to each individual to do their work to learn and grow, no matter what their background. It’s important for everyone to recognize and wield their own power. Yet we do not all start from equal places nor enjoy equal opportunity, so we also need to work without hesitation to uproot and dismantle the systems of injustice that still comprise our shared land. Those of us with more privilege have more access to change these systems and must invite people into those opportunities that may seem plentiful and commonplace to us. 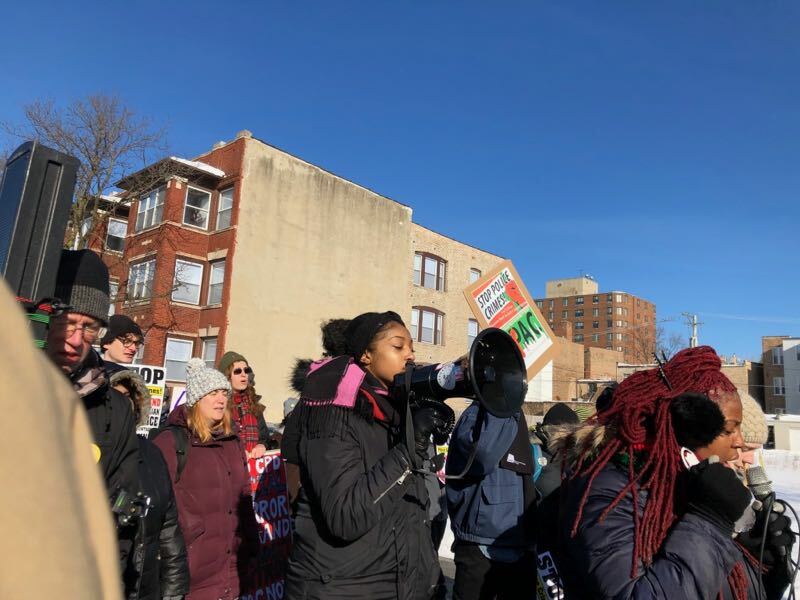 Black Lives Matter Chicago Justice for Laquan McDonald MLK Day 2019 rally after marching down King Drive. His legacy lives on. 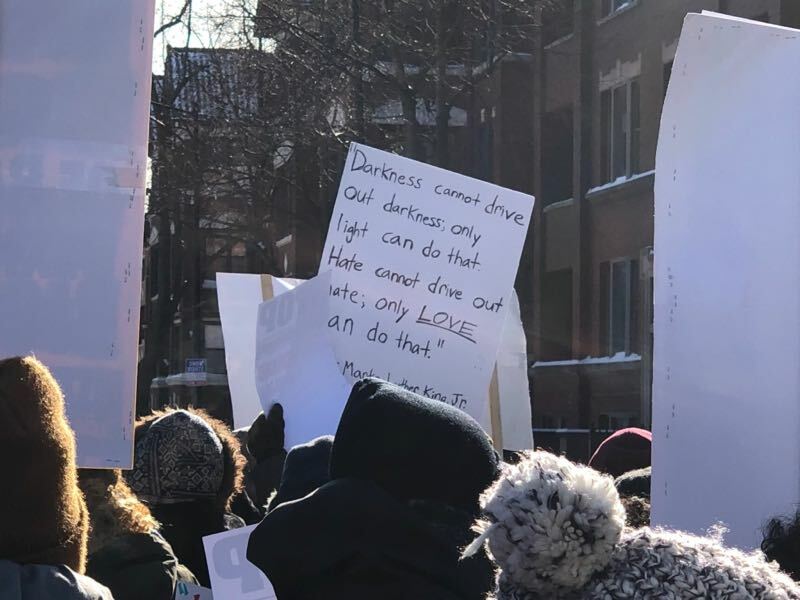 Reconciling my participation in this national holiday of whitewashed ignorance is also an exercise in love, which is something Martin Luther King Jr. believed in deeply. I’d like to think that we share a challenge getting people to wrap their hearts and minds around a true and full definition of integral love rather than simplification and commodification that limits love to touchy feely mushiness. This reduction of his identity based on limited love is ultimately what would make MLK more tolerable and even venerated by white people—the idea of this generous and loving black man who was willing to make peace and forgive. Love is absolute appreciation. It’s the ability to hold two seemingly opposing truths at once. Love is integrity. The space between disparate identities. It’s equal parts challenge and support. I believe MLK wanted to bring all people together in peace, but not at the expense of truth, reconciliation and healing for his own people. For instance, one of my favorite MLK quotes has always been, “Let us realize the arc of the moral universe is long, but it bends toward justice.” It’s easy to interpret this as a call to be patient, to wait for the universe’s natural tide to catch up to human morality. So let’s be sure to reconcile that idea with another favorite of mine: “Justice too long delayed is justice denied.” This one gets a bit closer to the urgency that I’m sure MLK felt throughout his work and certainly during his time in the Birmingham jail cell. “Darkness cannot drive out darkness; only light can do that. Hate cannot drive out hate; only LOVE can do that.” —Martin Luther King Jr. I want to get e-mails every so often from Lead from love. © 2017-2019 ANDY SWINDLER. ALL RIGHTS RESERVED.